soft goat’s cheese or even a good mascarpone would be fine. Scrub or peel the beetroots depending on the thickness of the skin – if the beetroots are very fresh, you might be able just to give them a good-old scrub. Use a mandoline or a very sharp knife to slice the beetroots into about 1mm (1⁄32in) rounds (certainly no thicker than 2mm/1⁄16in), and place the rounds in a bowl. a pinch of salt and a twist of black pepper. 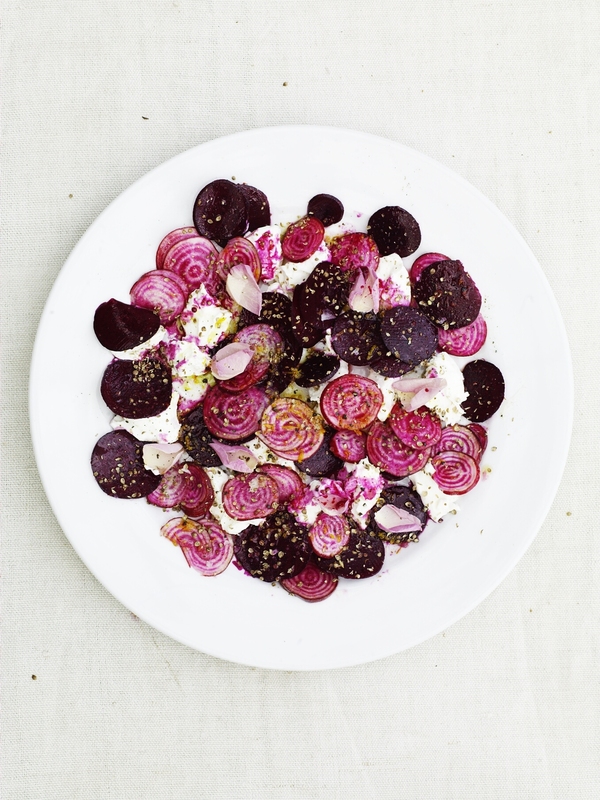 Spoon half the dressing over the beetroot rounds, tumble together using your hands, and allow the salad to rest for 15–20 minutes to soften the beetroot and allow the flavours to marry, mingle and mellow for a while. a little more dressing before bringing to the table.